The Storm in the Barn (Paperback) | Let's Play Books! In Kansas in the year 1937, eleven-year-old Jack Clark faces his share of ordinary challenges: local bullies, his father’s failed expectations, a little sister with an eye for trouble. But he also has to deal with the effects of the Dust Bowl, including rising tensions in his small town and the spread of a shadowy illness. Certainly a case of "dust dementia" would explain who (or what) Jack has glimpsed in the Talbot’s abandoned barn — a sinister figure with a face like rain. In a land where it never rains, it’s hard to trust what you see with your own eyes — and harder still to take heart and be a hero when the time comes. With phenomenal pacing, sensitivity, and a sure command of suspense, Matt Phelan ushers us into a world where desperation is transformed by unexpected courage. Matt Phelan is the illustrator of many books for young readers, including ALWAYS by Ann Stott and THE HIGHER POWER OF LUCKY by Susan Patron, winner of the 2007 Newbery Medal. 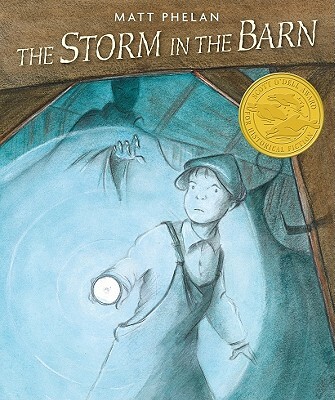 THE STORM IN THE BARN is his first graphic novel. He lives in Philadelphia. Superb graphic-novel evocation of childhood’s yearning and triumphs. Phelan turns every panel of this little masterpiece into a spare and melancholy window into another era, capturing an unmistakable sense of time and place… All the more impressive is how he balances fleet pacing (thanks to low word density) with a thoughtful, contemplative homage to storytelling and storytellers, which, in the tradition of the greatest tall tales, presents an empowering message that all a child needs to change the world is courage and ingenuity. A thoughtful, contemplative homage to storytelling and storytellers, which, in the tradition of the greatest tall tales, presents an empowering message that all a child needs to change the world is courage and ingenuity. Children can read this as a work of historical fiction, a piece of folklore, a scary story, a graphic novel, or all four. The spare, sketchy lines and soft washes of the mixed-media illustrations underscore the haziness of the dust-filled air…Phelan sensitively conveys the growing despair of the community as they watch their land languish…With its appealing format and touch of fantasy, this tale of coming of age in hard times will entice readers who may otherwise be indifferent to historical fiction. Measured, masterful panel pacing….use of color is simply stunning…potent subtext informs both Jack’s climactic showdown with the rain figure and the book’s tender, triumphant resolution.